Headlines shouting about the latest project being sold out have been regular in recent months. So has been news about rents rising at one of the fastest rates in the world. While this is great news for investors, it has raised concerns about the offerings available in the market to the broader population. The recent market slowdown at the top end has offered scant relief to this category, as offerings for them remain scarce even as prices have retraced by approximately 10 per cent in certain areas. An analysis reveals the median salaried individual in Dubai based on mortgage products being currently offered can hardly progress beyond purchasing a one-bedroom in Discovery Gardens. When the median income household is doubled (assuming a two-income family, each earning the medium income of Dh15,000 a month), the affordability extends to a two-bedroom at Sports City. The picture appears be equally stark when looking at rental expenditures; they are starting to consume more than 55 per cent of the median salaried household, raising the likelihood of a migratory effect to neighbouring emirates. 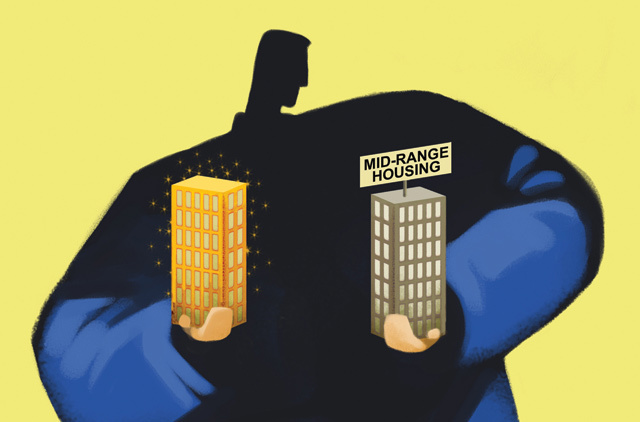 Whatever offerings have been provided for the mid-income segment have quickly risen to far beyond affordable levels as in the case of Springs, JLT and Greens, and more recently even Sports City. While these communities have exhibited high levels of mortgage activity (60 per cent more than the market average), they have started to taper off as prices become unaffordable for mid-income households (43 per cent of the population as defined by the Dubai Statistics Centre). This illustrates poignantly that the paucity of supply in this segment has caused investors to snap up these developments, causing prices to rise. This leads to a loss of the tag of affordability and failing to cater to the very segment they were designed for. The problem of mid-income housing is a problem that has been witnessed throughout the world as cities become increasingly urbanised and expensive. How various cities have attempted to tackle the problem sheds light on perhaps some of the steps Dubai can possible take to balance income demographics and keep the city from pricing itself out for an essential section of the populace. In New York, the then mayor Bloomberg encouraged and ultimately presided over the construction of 165,000 mid-income units by offering developers extra square footage (FAR) if they allocated a certain percentage of their development to mid-income housing, especially in areas where the cost of the land was high. This incentivised developers to offer such a product. In Western Australia, the government established a shared home ownership programme that allowed co-ownership with the owner-occupiers and allowed them to buy out the government share at any point within the first decade. In China, the government established the “Affordable Housing Programme”, whereby it offered direct subsidies of up to 30 per cent for median income purchasers. These approaches only serve to illustrate how cities have approached urban development increasingly by looking at income demography, especially as land becomes scarce. In smaller city-states like Singapore and Hong Kong, the role of real estate prices serves as a critical indicator for attracting talent. Recent moves by these governments to control speculation and the announcement that prices are likely to fall by the Singaporean finance minister was met with applause. It signaled that asset price inflation was something that central bank and finance officials are focused on towards not only avoiding an asset bubble, but also to retain and sustain the engine of growth. In Dubai, land scarcity is not an acute problem and opportunities abound for providing mid-income clustered units. A combination of government sponsored developers along with private sector launches will not only serve to keep the market well supplied but will also allow for the segment to participate in the upside. Incentivising private sector developers towards developing in high-density areas will further allow for supply to be rebalanced and enable a broader base of real estate asset ownership. Dubai has already curbed speculative money, and further steps will only further cement the opinion that in this real estate price cycle, rental yields will be the dominant factor rather than capital gains. This “new normal” in terms of investor expectations will facilitate a broader base of real estate supply and ensure that income demographics remain reasonably balanced.